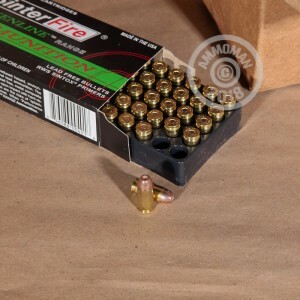 This .40 S&W ammunition from SinterFire's Greenline series fires a 105 grain frangible alloy bullet (dubbed "Frangible Reduced Hazard V-Force") that disintegrates into powder upon contact with hard targets. It's an excellent choice for realistic tactical training or steel target shooting due to its strong resistance to ricochets. 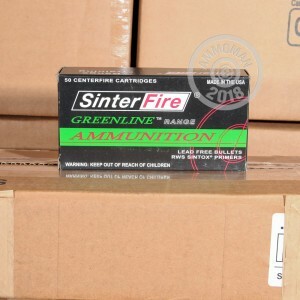 SinterFire of Kersey, Pennsylvania is an industry leader in the frangible ammo field. The company has carried out R&D in this area since the late 1990s and holds many patents on ammo designed to enable safer, more effective live-fire training. 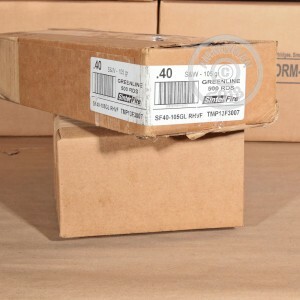 These cartridges come in 50-round boxes and use Sintox lead-free non-corrosive Boxer primers and brass cases.